Green City Living/Our BLOG: A Reusable Thread/Greener Groceries: What's available in your community? I'm always surprised when I am at a busy grocery store and there aren't very many shopping in the Bulk Bin aisles. I think many people aren't informed about the benefits of buying bulk, so today I'd like to share with you why bulk buying is beneficial and inform you of all the different types of products you can buy bulk. You may be amazed! Waste of course is the number one reason to start shopping this way. If Americans purchased all of their coffee from the bulk bins for 1 month, 20,000,000 pounds of foil packaging would be saved from landfills. That’s the equivalent weight of 7,667 compact cars. If the average American family bought peanut butter in bulk for 1 month, 122 pound of waste per family would be saved from entering landfills. You may think all the plastic bags and containers you use to scoop out your bulk items are waste too, but I have two answers for this. First is that many of those plastic bags are recyclable or reusable, and second is that you can bring your own containers. The container needs to be weighed first on its own, then that weight is subtracted from the total weight to help decide the cost of the item you are buying. Saving money and product are the next reasons. You only buy what you need and won't have excess that goes bad or you never use. For example, a couple of years ago I started making my own elderberry syrup. I bought a package of elderberries online and did not even use half of the package. Now I buy elderberries in bulk. I buy just 1 cup which will get me 1 recipe that lasts for weeks. One more benefit is you get to examine the food up close. Is there a funky looking piece in the mix? Does the flour look fresh? Does the item smell like it should? 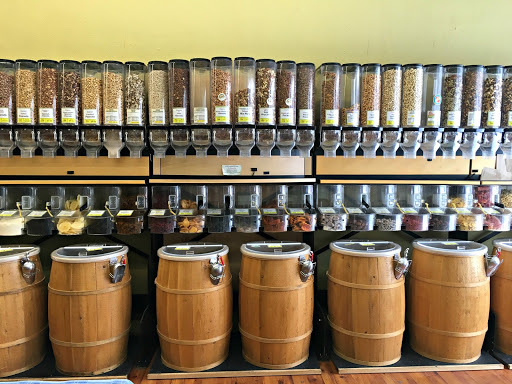 There is a local store near me here in north Boulder/Denver called Simply Bulk Market that specializes in ALL BULK. 100 jars of spices, 10 different kinds of oats, 16 varieties of beans, 18 mixes of rice, etc. They also have flours, sugars, coffees, teas, cereals, trail mix, nuts, dried fruits, chocolates, pasta, dog food and treats. These items you might expect, but the list goes on to include cooking oils, honey, cleaning solutions and detergents, soaps and shampoos. It really is amazing and very fun to shop! You walk in and sling a basket over your arm. This is your cart! Scoop or pour the amount you need of each item. Bring your own containers or purchase from the store to use again and again. Write down the number of the item, bring it the check out area to weigh and pay. It’s really quite simple and you leave feeling good, knowing you bought just what you needed for an allotted time AND you shopped a small local biz. I’ve been munching on my chocolate toffee almonds all week. Yum! What items would you like to start buying bulk?